← Questions From Israel: How and Why Trump? In her effort to become the first woman President of the United States, former First Lady Hillary Clinton easily won three Democratic primary states Tuesday night. Clinton won, by comfortable margins, in Ohio, North Carolina and Florida, In Missouri she finished slightly ahead of Vermont Senator Bernie Sanders. In an unsettling display of her nagging vulnerabilities, Clinton had to hold off a late surge from Sanders, to gain a narrow victory in her home state of Illinois. What really matters in these primaries, however, is not the popular vote, but the number of delegates won. Clinton’s impressive victories in Ohio, North Carolina and Florida gave her enough delegates to leave her with an almost insurmountable total of delegates in her campaign to return the Clinton family to the White House. She and her husband, former President Bill Clinton, lived and served there from 1993 to January, 2001. Clinton’s pro-Israel stance had projected easy victories in Florida and Illinois, two states with heavy Jewish voting pockets. She did win impressively in Florida but she almost lost Illinois in the popular vote totals. One of Sanders’ weaknesses is that his Vermont-based political career did not call for extensive minority interaction. Sanders has been a civil rights activist while a student at the University of Chicago. In his political career his focus has been more on economic reform, not issues of peace and justice. His economic focus is a strength, but he still runs well behind Clinton in endorsements from racial minorities and from women. That is a high barrier for Sanders to climb. Sanders did gain one important female endorsement, which was reported by Washington Post political writer John Wagner before Tuesday’s primaries. KISSIMMEE, Florida—The thousands of people who have streamed to Bernie Sanders’s rallies around the country in recent days have been treated to an opening act — Rep. Tulsi Gabbard of Hawaii — who arguably does more to articulate Sanders’s views on foreign policy than he does. 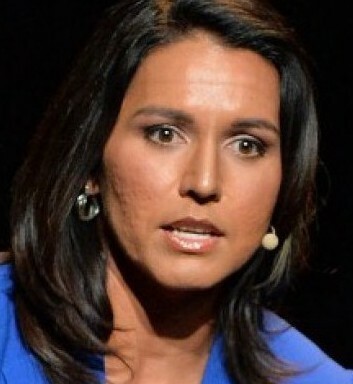 Gabbard, 34, who resigned as vice chairwoman of the Democratic National Committee last month to endorse Sanders for president, has been tasked with introducing him at recent events, including one here Thursday that drew more than 5,000 people. Unlike the Vermont senator, who focuses heavily on domestic policy at his rallies, Gabbard is talking about U.S. entanglements abroad. And she doesn’t pull any punches when relaying what she sees as a crucial difference between Sanders and her party’s front-runner, Hillary Clinton. A female member of Congress who supports Sanders’ stance against interventionism, should strengthen Sanders’ foreign policy credibility among progressive Democratic voters. Clinton’s relationship to African American voters is one reason she has won easily in states with substantial African American voting bloc, especially among the older voters. In Illinois, Sanders aggressively attacked Clinton for not rejecting the endorsement of her long-time ally, Chicago Mayor Rahm Emanuel. The mayor’s fight to keep a police video of the shooting under wraps led to weeks of street protests, allegations of a cover-up, calls for resignation and a plummeting approval rating. Sanders also criticized the mayor’s decision to close nearly 50 schools, which had a special impact on minority neighborhoods. The narrowness of her home-state Illinois victory was a downer for Clinton, but she continues to build on her large delegate lead. Clinton’s stump speech of inspiration, unity and interventionism “to keep us safe” is well received by Democratic audiences. Assuming this response continues in upcoming primaries and caucuses, her nomination now appears virtually assured. Sanders’ campaign rhetoric, however, has exposed vulnerabilities accumulated during her long political career. Her interventionist stance, for example, disappoints many in the party’s progressive base. Her unrelenting pro-Israel stance is not encouraging to voters who believe Israel’s occupation is both immoral and destructive. Donald Trump, her likely Republican opponent in the general election, has won strong support among what pollsters describe as “white evangelicals”. Trump stepped on the third rail of vulnerability in American politics when he promised to deal with the Israeli-Palestinian issue from a “neutral” stance. That incongruity from a conservative Republican candidate has not slowed Trump’s momentum. In spite of her vulnerabilities, Clinton now appears to be the last hope to prevent a Trump general election victory. Trump added to his delegate total Tuesday, winning three states, including Florida, Senator Marco Rubio’s home state. Rubio lost to Trump by a two-to-one margin, which led him to suspend his campaign. Governor John Kasich finally won a primary–his home state of Ohio–and quickly emerged as the Republican establishment’s new preferred choice over Trump. Clinton’s vulnerability to Sanders’ strategy of linking her to political and public figures who have antagonized ethnic minorities, is a strategy that an apt and well-mannered candidate like Kasich, could use to cut into her voter base. Assuming Clinton has locked up her party’s nomination, she could not have asked for a better sparring partner than Sanders to prepare her for her main bout in November. Sanders, of course, still believes he would be a better nominee than Clinton. He plans to continue to persuade voters to give him that responsibility. Buckle up, it is going to be a wild ride to the two conventions, and beyond. Correction: In an earlier version of this posting, I referred to states where Democrats follow a “winner take all” allocation of delegates. This was incorrect. All of the Democratic primaries and caucuses allocate delegates proportionally. The picture at top of Rep. Tulsi Gabbard, is from the Washington Post. This entry was posted in Bernie Sanders, Donald Trump, Hillary Clinton, Middle East, Politics and Elections. Bookmark the permalink. Trump is doing surprisingly well because he represents a populist and nationalist rebellion against what Congressman Charlie Lindbergh called our “invisible government” on Wall Street, which speaks through the CFR and controls the major media and the two major political parties. He was against our interventions in Iraq and Libya. He wants the U. S. to be an honest broker between Jews and Arabs in the Middle East. His problem is his speaking style, but he can and will probably shape up before it’s too late. He is against open borders and mass migrations which threaten American identity and civilization. He is against free trade agreements which cost us American jobs. But I have no clear idea why Hillary Clinton is doing well. She favored our disastrous and unconstitutional intervention in Libya. She did not tell the truth about Benghazi. She supported the Anglo-American invasion of Iraq. She is not liked. Participation in Democratic primaries is down. The Democrats have plenty of honest, upright, risk-free, talented people to run for President, — people who should be able to defeat Trump in November. Can anybody tell me why Democrats are so in love with Hillary? Thank you, Jim for an articulate and fair description of what the field looks like today. Even though my hunch was that Hillary will win, I voted for my conscience – for Bernie Sanders. I feel that he will be the most principled candidate amongst, both, the Democrats and Republicans. I also feel that he will be an “America Firster”, not an “Israel Firster”, when it comes to Israel’s occupation of the Holy Land. If Hillary persists in her support of Israeli occupation and hegemony over the region, then it will generate and escalate surges of relentless hatred for our country, since the US is the “sole” effective enabler of Israel’s occupation, colonization of East Jerusalem, West Bank, Gaza, and for supporting Israel’s tyrannical apartheid regime, and its absolute monopoly of the nuclear weapon in the Middle East. Yes, for her personal gain, Hillary can support all those atrocities and crimes against humanity, if she wishes. However, it will end up being a crime against our own U.S. of A, and it will lead to unimaginable suffering and acts of vengeance against our country. And, I am afraid that we will not be immune to it in future. Hillary has the option to learn one lesson from Donald Trump and take a position of “Declared Neutrality” between Palestine and Israel This did not seem to harm him in the least. It may be a deceitful and treacherous declaration that Trump can manipulate and change at a whim. However, at least this is his official position, and he was brave enough to enunciate it, when he had no reason to divulge it. And even more importantly, it will behoove Hillary to learn about what makes Sanders gain so much of the vote, just by taking an independent view from Big Money, and yet succeed against all odds. Indeed a wild ride to the the two conventions on top of a very entertaining election campaign. Still feeling the Bern! I hope he can do more than hold Hillary’s feet to the fire. I thought the Gibbard endorsement would have yielded better results last night. I have tried a number of times to visit with someone in Bernie Sander’s campaign office and have not been able to speak with anyone. I honestly believe if their campaign office would make the clear distinction between Bernie the Statesman and Hillary the Politician that people would support Bernie. The “mainline” media has spoken. Bernie sanders was the ONLY candidate NOT given air time after the results were in. The “mainline” media has nominated Hillary and Donald. Donald, of course, is the one who will be elected. Ready for that? Then get out the word-of-mouth for Bernie! Good article, Jim, but I obviously disagree with you. You are still one of the best!! !